This shoe haunts me. When I was 5, for some unknown reason my mother used to actually buy these for me… her reasons for doing so were either to inflict pain on her only daughter or let me walk around with blocks of fashion crime on my feet. I’m guessing it was the latter, but in her defence it was the 90s and anything went. Memories of wearing these awful, hideous shoes still to this day bring back the agony of blisters caused by days at the beach, where the sand decided to turn itself, not into sand castles, but sharp glass met by the tight straps and impossible buckles of the jelly shoe. THE HEEL, WHY OH WHY? The original jelly shoe was painful enough, especially in sweltering heat (not that it’s a negative factor in Britain). I can only imagine this clumpy little asset would only add to the torture and it makes it look blindingly horrendous. It has been difficult over the last few weeks to walk down the high street without seeing these creations splashed everywhere… I’m highly doubt I will be purchasing some anytime soon, (mainly because I’d need to remortgage my house to afford them). However, learn to embrace those who do find comfort and beauty (God knows how) in these little creations of mingingness. 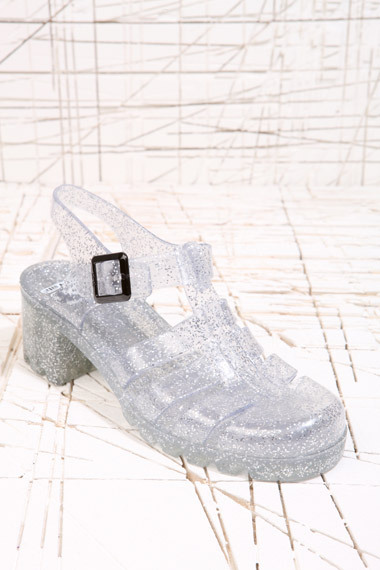 But for those who choose to reopen their past and slide a pair of plastic pain onto their feet, there are some nicer sandal versions sold in Topshop and RiverIsland for a more healthy price. I must have had some strange rose-tinted memories of jelly shoes. I thought I loved them as a kid, so when I was on holiday last year I bought some for the beach. They are THE most uncomfortable shoes I have even worn! Haha! My mother clearly wanted me to suffer! Oh, they are awful I have to say! And it’s really not about having sweaty feet in them. Gross! F/W 2013 Trend Menswear-Inspired Pieces: Are Women stealing their Style from Men?